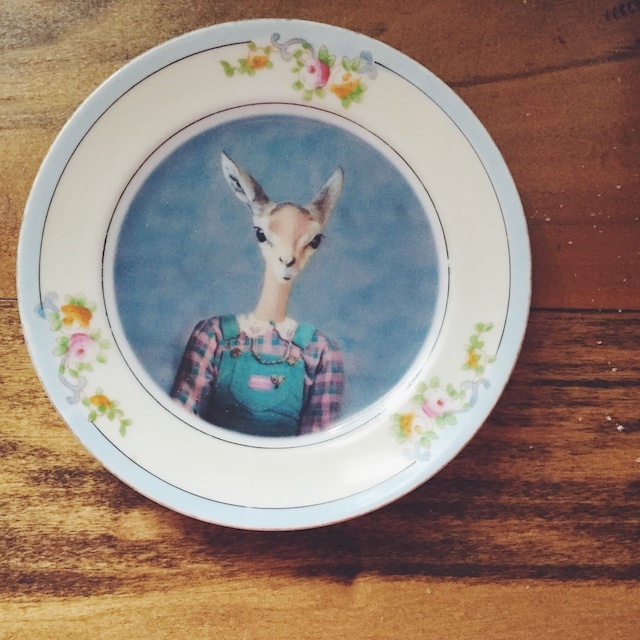 My So- Called Handmade Life: All I want is what I..I have coming to me. All I want is my fair share. All I want is what I..I have coming to me. All I want is my fair share. It's been a difficult and wonderful summer all at once. 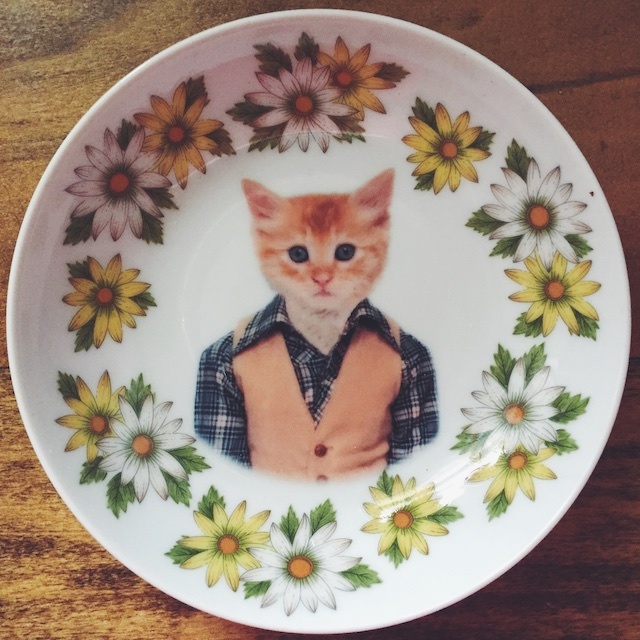 Maybe that was the impetus for my treating myself to a few things from my Pinterest list that I had been saving for. I'm not usually super material, but sometimes I can be an emotional, impulse shopper. That time was about 2 am in my pajamas, then the next afternoon (still in my pajamas), then the following week (in "workout clothes" that look exactly like my pajamas). I'm sorry, but I'll be dragging you along to see the fulfillment of my Sally-esque Christmas list for the summer. Oh, and I'm going to be linking like crazy. First up, was the sweater's worth of Gynx Yarns I already showed you. I was thinking it was my first sweater's worth of indie yarn, but then I remember knitting both Georgia and Hetty with Gynx Yarns' colorways. But, like I said, Hetty was a happy accident- a miracle of spit splicing hoodoo, so I don't really count it. Thus, my need to buy Smooth Sport for Pomme de Pin. I also took advantage of a sale Laura had on all of her experimental color ways, dyed in preparation for SSK. 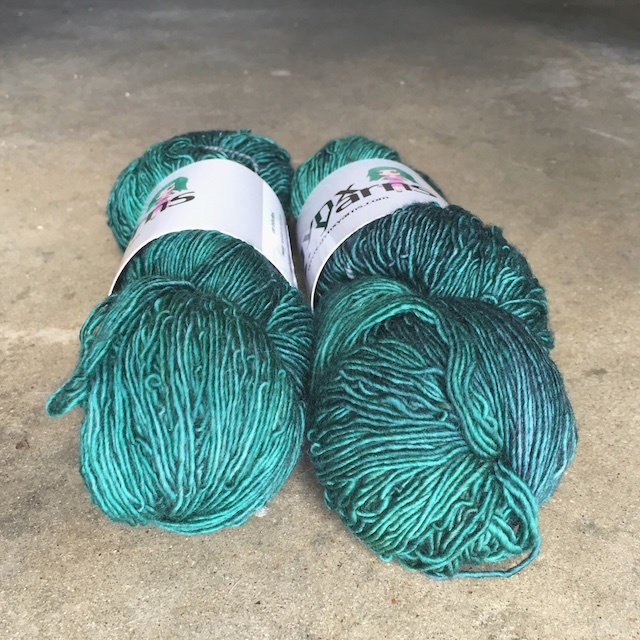 I ordered two skeins of this green that makes me think of Blue Rug Juniper. 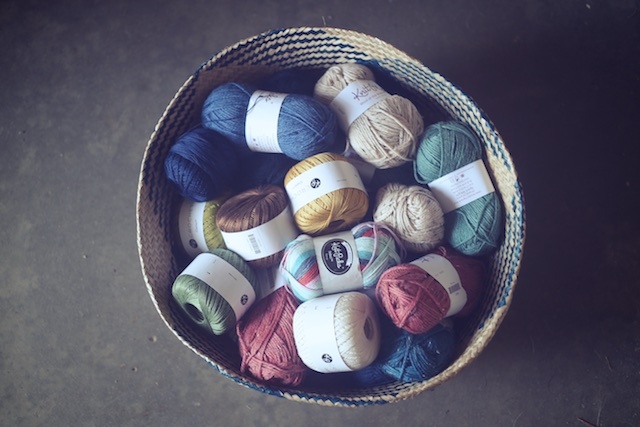 Another dyer I wanted to try out was Sarah, of January Yarns, who I first met through Holla Knits Knitalongs. Her Block Island is so beautiful knit in her own yarn. And look at her gorgeous Oshima! I love everything she makes with her yarn. Everything. 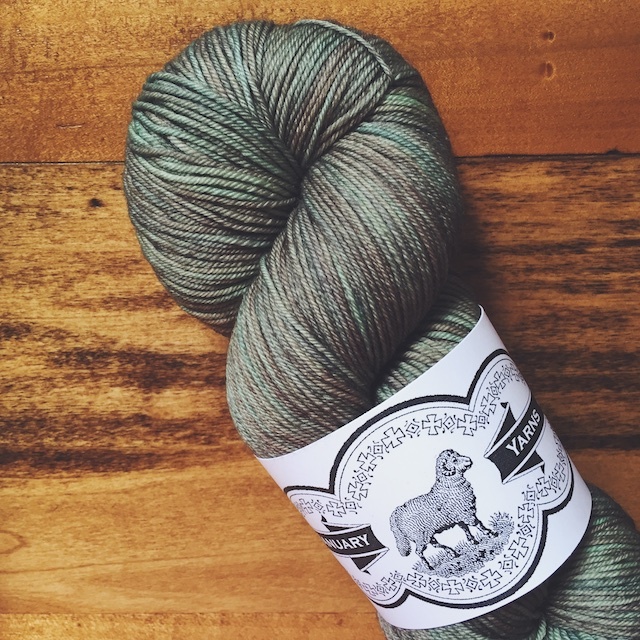 (Have you seen the Blue Spruce colorway?!) There will be a sweater knit in January Yarns in my future. So, I got a skein of her Staple Sock in the Out of the Woods colorway to knit my Industry shawl. Maybe you realize by now that forest-y greens are my thing, and this is my bestest color. I want to look at it forever. It would be right at home growing in the middle of my succulents. 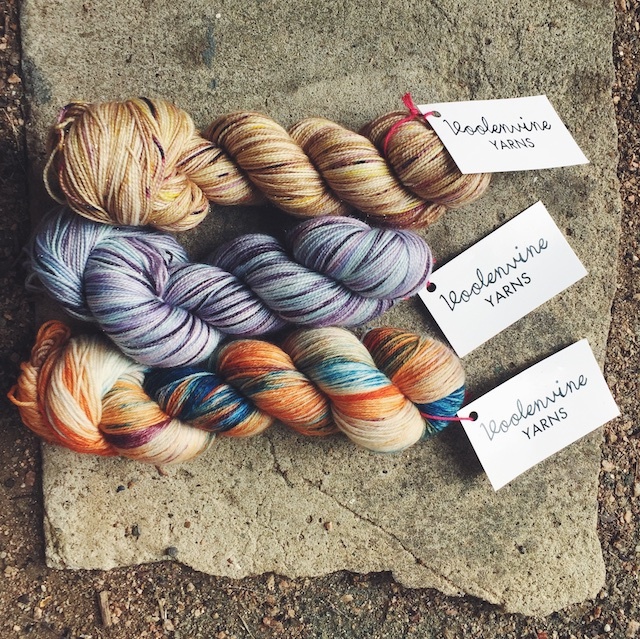 The last thing I wanted to try was some variegated colorways from Kristin of Voolenvine Yarns. I've admired her semi-solids for some time, using the Nevermore colorway for my Renfrew. But I wanted to try some of the popular variegated colorways I see in her podcast and popping up on Ravelry. This required me doing a very geeky thing: waiting until the exact moment of her shop update and hurriedly loading up my cart. Of course, though I clicked quickly, the Outlander colorway was sold before I could submit payment. 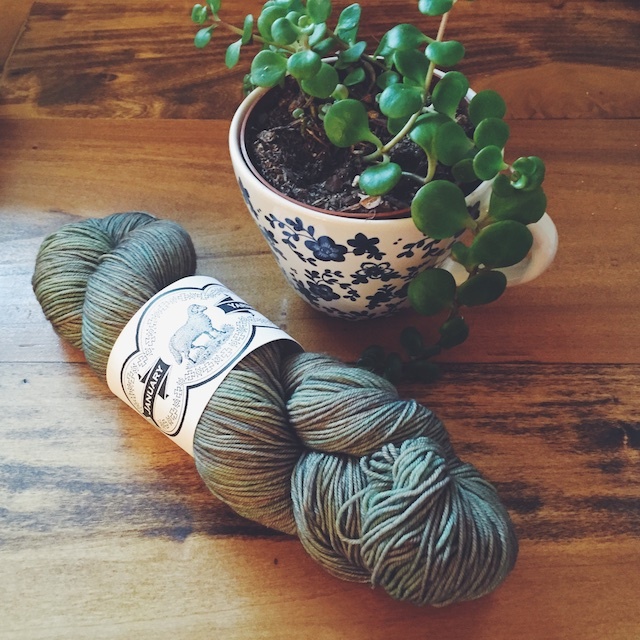 I then went through the fumbling process of deleting it and loading up an Outlander Misfit skein instead. 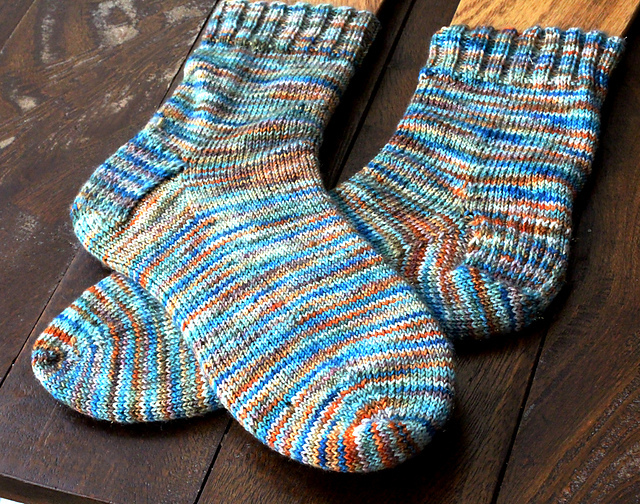 You can see the Outlander colorway below, used for her Vanilla Sock pattern. Though the Outlander series is not my bag, I am not blind. This is a gorgeous colorway. Can anything beat a blue/orange combo? Kristin has a fantastic sense of color. Hopefully the misfit version will give a similar effect as the original, because I don't see myself ever waiting for a shop update, with baited breath, again. Unless I have another after-crisis pajama day. 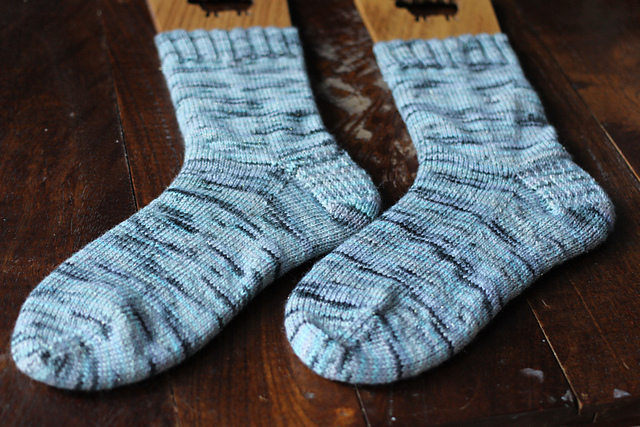 I also tried her Reflektor color way, that looks awesome as both socks and hats on different raveler's pages. After making my indie dyer dreams come true, I cut myself off from that kind of purchase for the rest of the summer. Big of me, I know. 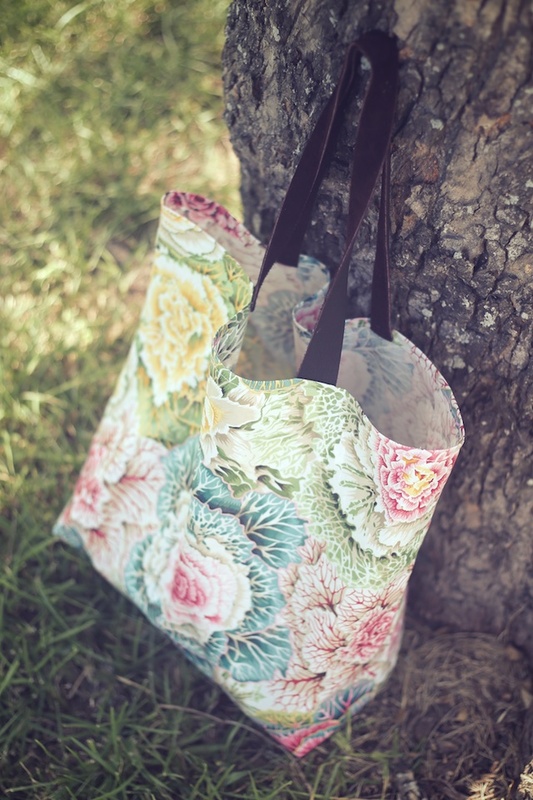 The next project tote was from Kelley, seamstress and knitter extraordinaire, of Casa Crafty. 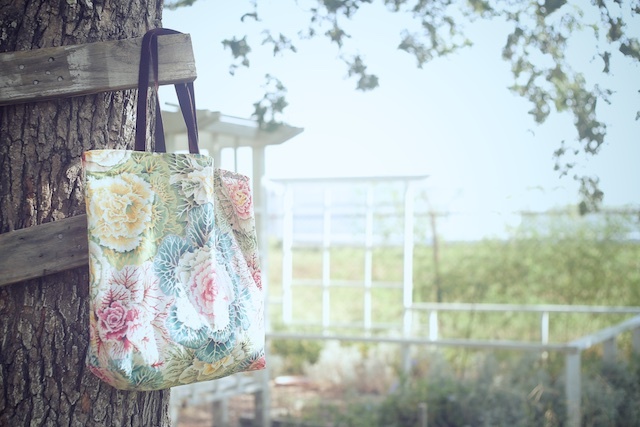 The Cabbages and Kale Leath Tote is made with BPA-free laminated cotton canvas, which isn't stiff at all. I think the leather handles are a nice touch. This is where Pomme de Pin is living at the moment. Kelley was so kind as to include a sympathy card for my grandfather's passing in with the bag and wallet I purchased, which touched me very much. 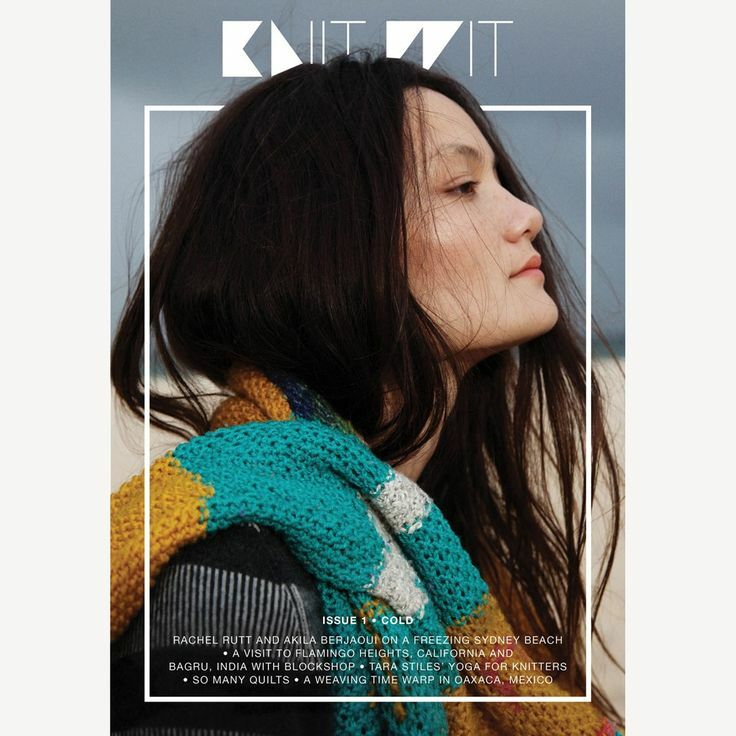 I also finally got the first two issues of Knit Wit from Fringe and Good Night, Day. Because I already had a Karbonz midi set that I'd won in a giveaway earlier this year, I only needed the Karbonz starter (or mini) set to have all of the needle tips. This was great because I wouldn't pay for a full set when I had odd needle sizes, here and there, around my house. I think these are going to make my crafting so much easier. 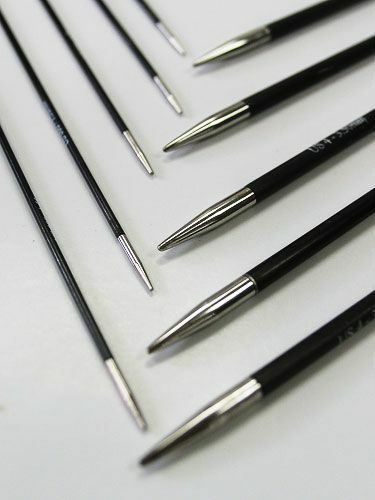 They allow me to knit up a needle size or two, with my loose gauge, and the needle tips are long enough for comfort. I'm not having to constantly re-screw or re-click them, either. You know how that's an issue with interchangeables. Now, I'm ready to cut myself off on all things fiber. 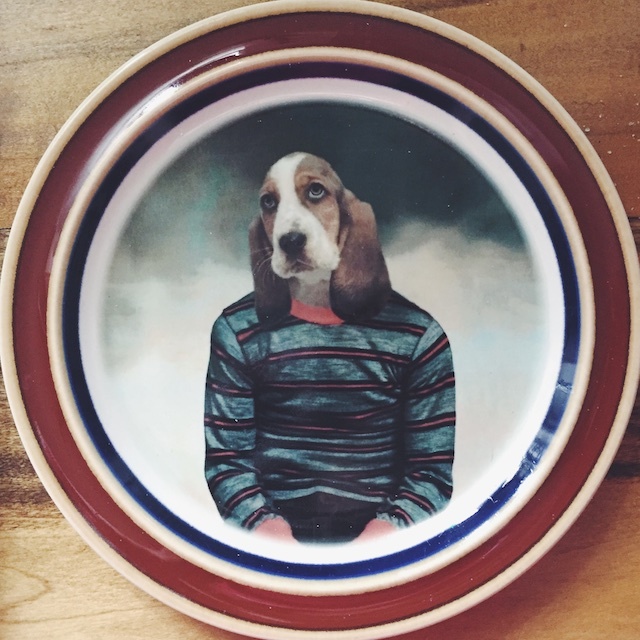 However, there was one thing I really have wanted for around the house- some Beatup Creations plates for my kitchen wall. Our kitchen remodel was almost finished when all of the excitement began this summer, so we're not quite there. 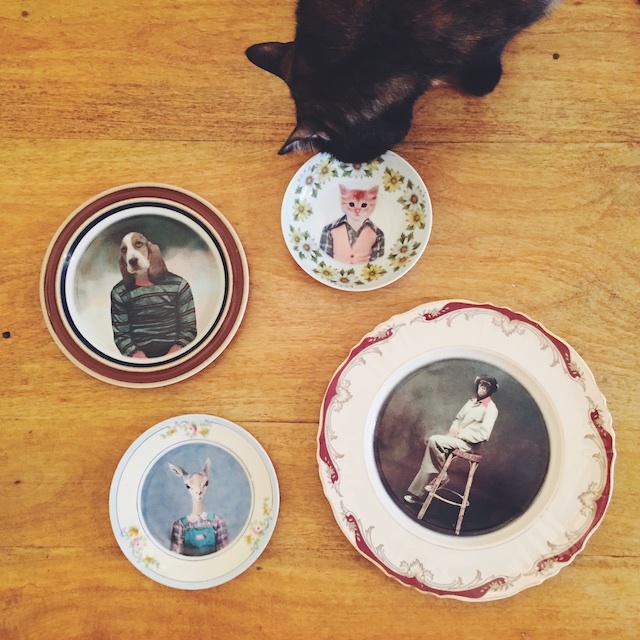 But when we are, I'll have plates that my son calls disturbing as the finishing touch. Do I sound like Sally giving Charlie Brown her Christmas list? Keep in mind, I'm not normally all about indulgence. And, of course, there are plenty of people who would think a big sack full of string is a pitiful excuse for indulgence, but I am who I am. I'm mostly frugal. Knit Picks orders every few months and books are my one extravagance. My life has been very centered around family members for several years, and I've let most of my personal pursuits slide- except for knitting in the evening. 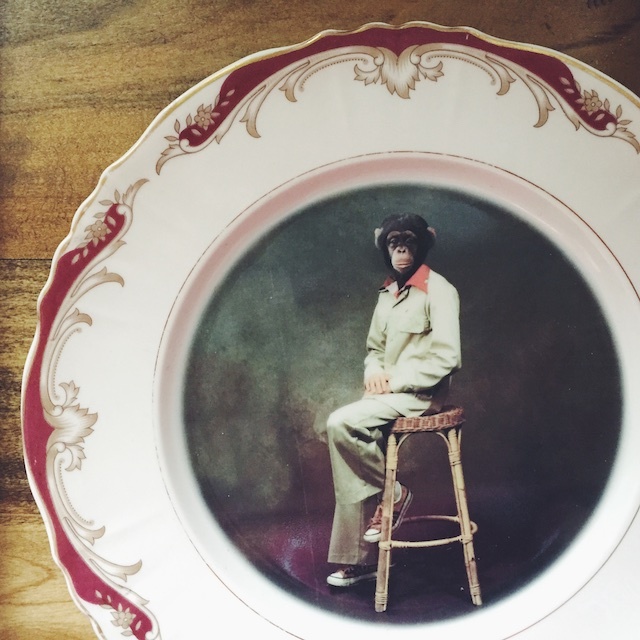 Even when I had free time for myself, I felt a heaviness that made my hobbies less enjoyable. I think that's just how it is for people when they go through crisis. I'm not sure how much that will change now that my grandfather has passed. 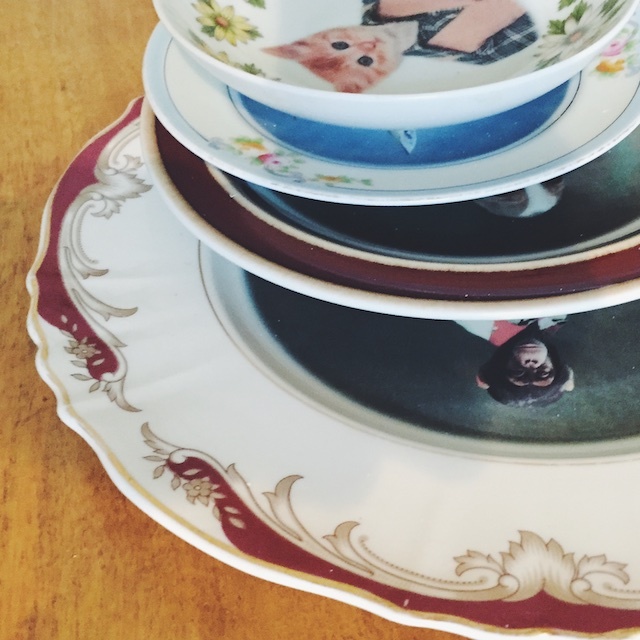 I want to live quietly and restfully for a time, especially since the wedding fervor is over. I want to remember to eat three times a day, sleep 7 or 8 hours, get a little exercise, and try to balance out these crazy hormones. So while the rest of ravelry is taking about yarn diets, I'm here pigging out on my fiber binge. But as I told another knitting friend recently: it's not like I'm doing crack with the family fortune. It's just yarn. Also, I'm not showing these as some sort of "Look at me! I've got stuff" kind of post. 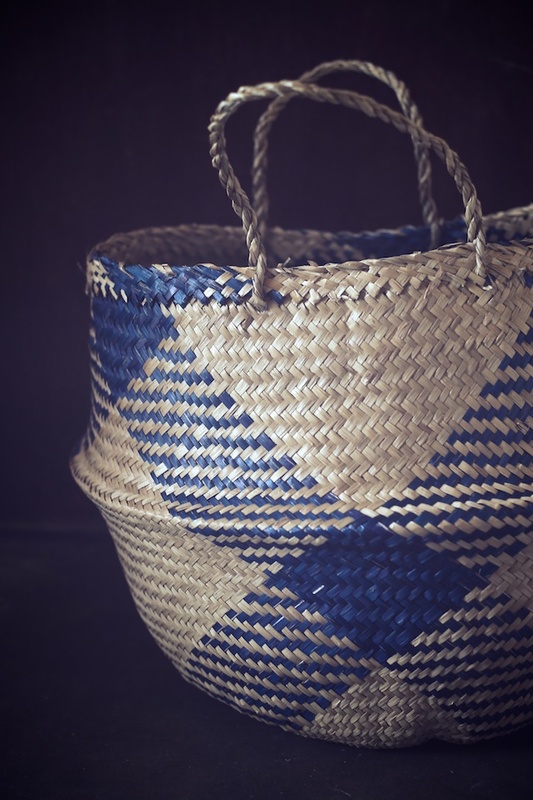 It's more about the promise of being reinvigorated and enjoying the things I create again. It's a "Look at me! I'm gonna enjoy new stuff!" kind of post. My last unmet desire is to get a camping trip/ sleep fest, now that the dust is settling. One year, we were all so tired from the pace of our lives (or, in my kids' case, from being teenagers) that we got to a campground just after dark, set up our pop-up, and slept straight through until after lunchtime the next day. Long, lanky bodies littered our little camper, unmoving for like 13 or 14 hours. That was a good trip.